July’s At-Wharf-Gate (AWG) prices for logs delivered to ports around New Zealand are relatively unchanged from June prices. However, some exporters have strategically changed some prices of various grades and lengths, but the overall average price remains unchanged. There has been the usual seasonal slow-down in log demand as the weather heats up in China and log stocks have recently risen by an average of 50,000m3 per week to a current level of 3.7Mm3. Some log exporters are concerned the falling stock market and the weakening Chinese currency is denting confidence in the Chinese construction industry, but other log exporters are not so pessimistic on the Chinese log market. The NZD has also weakened against the USD and this has provided some relief to NZ exporters as they contend with increased container shipping costs that were mentioned in last month’s Wood Matters market update. The destination of sawn timber exported from NZ is graphed below. Log exporters maintained prices they paid for logs delivered to NZ ports in July. The sales prices in China are relatively unchanged from last month. 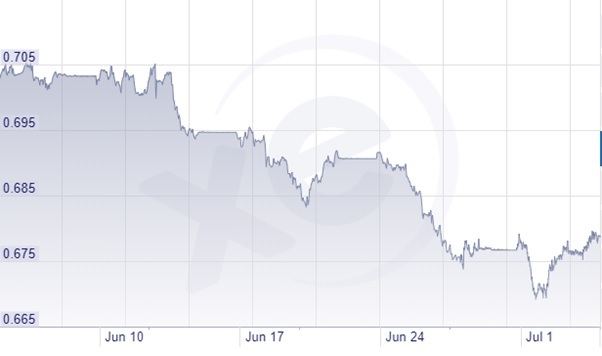 The weakening of the NZD against the USD has offset an increase in shipping costs. The total inventory of softwood log stocks in China has risen by 50,000m3 per week recently and now sits at approximately 3.7Mm3. The supply from South America has slowed down due to some quality issues and the price gap between the NZ pine and the South American pine has widened. There is usually a slow-down in log consumption in China as the temperatures increase. 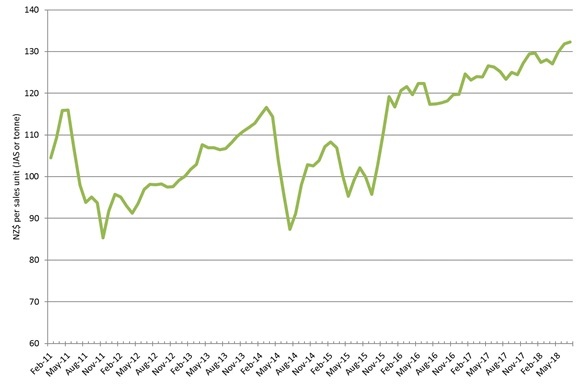 Average daily port offtake through June was 75,000m3 whilst April/May was 85,000m3 with peaks at 100,000m3. Exporters are divided on whether we are seeing the seasonal change or a deeper shift in log demand. Log exporters have signalled a concern over China for two reasons. The weakening of the CNY has reduced the buying power of the Chinese log buyers. The Shanghai stock market has now fallen 20% since January, with significant drops in the last couple of weeks. This has added negative sentiment to a construction industry that was already showing a decrease in confidence. 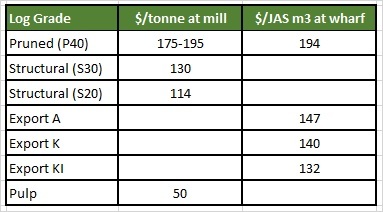 The Indian log market has reached price parity with the China market with A longs now selling for USD 159-160/JASm3. 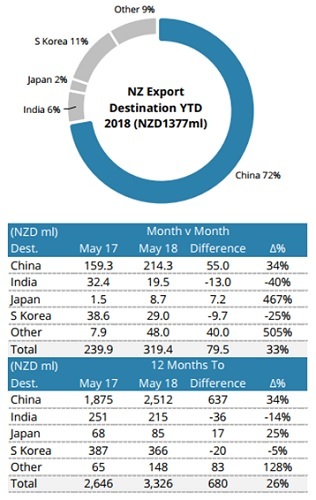 While volumes delivered to this market are 14% down year on year to May 2018, it has been a steady market and exporters still expect an increase in demand in Q4. 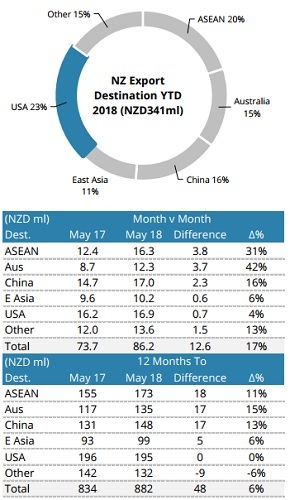 There is an increased schedule of ship arrivals from NZ over the next six weeks, so this will be a good test of this market. Containers of logs are also arriving from Germany, South Africa and southern yellow pine from the USA. The labour shortage mentioned in previous Wood Matters continues, but some labour has returned to the mills from agricultural work. Log stocks are about 120,000m3 in Kandla and 30,000m3 in Tuticorin. The cash flow of log buyers is still tight after the introduction of GST and the increased scrutiny on bank lending compounding the weakening of the Indian Rupee against the US Dollar. Ocean freight shipping costs for NZ log exporters have increased by 10% over the last month. Currently it is hard to get ocean freight to China for less than $30 USD/JASm3. Most exporters do not see these rates dropping over the next couple of months. As you can see in the charts below the Brent Oil Price has risen as have the bunker prices. Singapore Bunker Price (red line) versus Brent Oil Price (grey line). 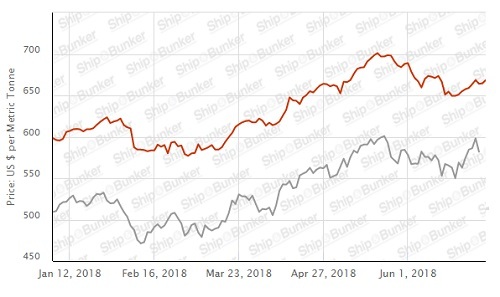 The Baltic Dry Index (BDI) is a composite of three sub-indices, each covering a different carrier size: Capesize (40%), Panamax (30%), and Supramax (30%). It displays the average USD hire paid per day across 20 ocean shipping routes. Whilst most of the NZ log trade is shipped in handy size vessels, this segment is strongly influenced by the BDI. 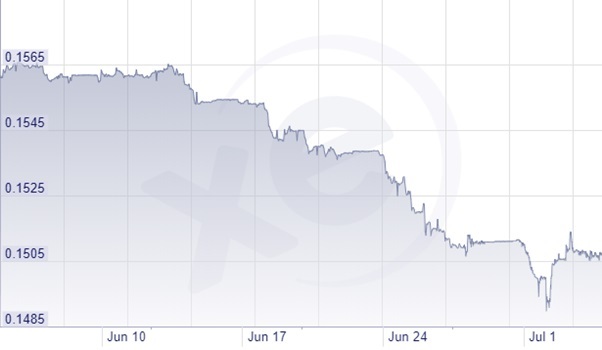 The graph below shows the BDI continues to increase. The PF Olsen Log Price Index remained at $132 for July. While some pruned prices decreased around the country, this was balanced by an increase in sale prices for structural and pulp logs in the CNI. The index is currently $7 higher than the two-year average, $11 above the three-year average, and $18 higher than the five-year average. Scion’s Carel Bezuidenhout's conducted his quarterly ‘Scion Forest Industry Business Outlook’ survey in May. For this survey 58 people responded from across the supply chain of the NZ forest industry. Except for domestic processors, business expectations remain relatively positive. 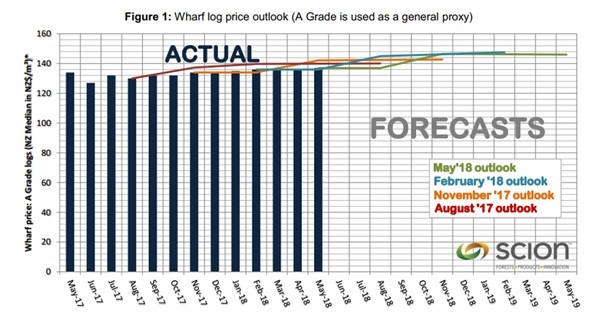 The collective predicted A grade At Wharf Gate (AWG) price is graphed below.